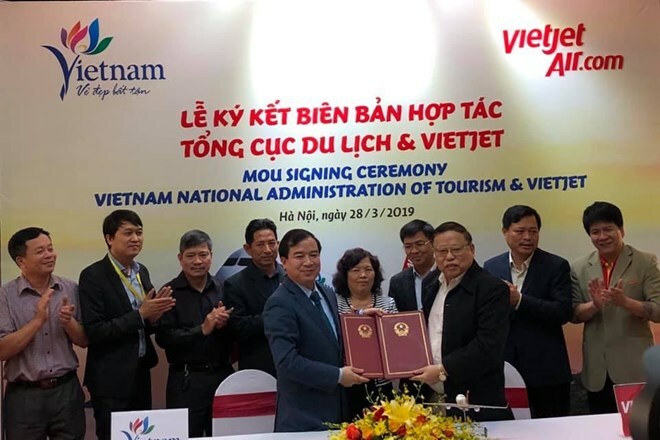 Hanoi (VNA) – The Vietnam National Administration of Tourism (VNAT) and Vietjet Air signed in Hanoi on March 28 a Memorandum of Understanding on cooperation for 2019 – 2021. Under the MoU, the two sides will work together to increase promotion on mass media; introduce publications, documents and market researches; cooperate in an international tourism fair and Vietnamese tourism abroad; and organise domestic destination surveys and events. The MoU provides travel opportunities and convenience for Vietnamese people and international tourists, connecting Vietnam to destinations around the world, where Vietjet has direct flights. This is also a concrete effort to contribute to the implementation of the growth target plan assigned by the Prime Minister to welcome about 18 million international visitors to Vietnam in 2019.